Let Theobroma Chocolatier make your corporate gifts as easy as they are creative, with chocolate logo bars, buckets, baskets and personalized chocolate coins. 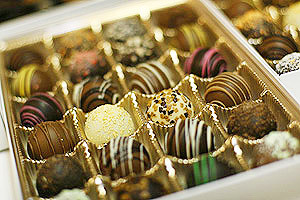 Make your company, event, or celebration special with personalized chocolate. Let us immortalize your company’s name or logo in chocolate. Just bring us the artwork you want, and we’ll take it from there. You can even make an impression with a personalized box. Business card size + up -2 oz. – 2 lb. Bars packaged in gold, or white view boxes. Camera ready, or laser print black/white art work required. Custom art work must be rendered as line drawing. 2 to 3 weeks set up, one time. Pricing starts at $1.50 per bar. Prices vary depending on bar size. Over 100 styles to choose from! Hot stamped – many colors to choose from! You can also provide your own custom camera ready, or digital laser printed art work! -Custom art work must be rendered as line drawing in black/white. Maximum personalized image size is 4″ x 6″. 2 to 3 weeks set-up time. Minimum order – 50 boxes. 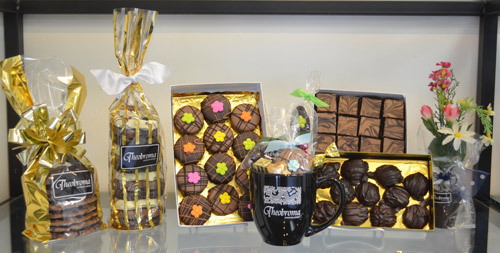 Surround your personalized chocolates with other Theobroma treats in one of our gift baskets, buckets, or bags. Choose your own sweet gift goodies, or let us design your special gifts for you. Either way, we can help, whether your gift is for one special client, or a thousand loyal employees. Best of all, we can design a gift to meet your budget. We’ll even take care of arranging for local delivery, and shipping nationwide; enclosure cards and all! Want to know more? Email us.